When I stumbled upon a recipe for mashed potato cheddar & chive waffles from Joy The Baker the other day, I swear I heard the faint sound of violins. I mean, waffles… with cheese… and mashed potatoes! What could possibly be better than that winning trifecta? And who knew you could put mashed potatoes in waffle batter? But more importantly, who even has leftover mashed potatoes to begin with?! My inner-Belgian was intrigued, so I baked Joy’s waffles that same night and I thought they were really good. As in ‘I binged on 6 waffles in one sitting’-kinda good, and then impulsively grabbed the last sole survivor this morning for breakfast-on-the-go and ate that one ice cold because I was desperate I was in a hurry. Let me tell you, any waffle that tastes this good after being left overnight on the kitchen counter, should be considered a mortal sin. It made me ponder the question, if this much tastiness can be achieved with cheddar & chives, how wickedly delicious would these waffles be with, let’s say, bacon? And what if we replaced the mashed potatoes with puréed butternut squash for instance? With visions of savory waffle greatness, I took Joy’s recipe and ran with it. Like a thief in the night. Even malicious recipe-snatchers foodies like me sometimes need a late breakfast-brunch idea, and these Fall-inspired waffles are perfect for those days on which your uterus bleeds uncontrollably you crave something salty & sweet or you need a unique alternative to a dinner roll. The mapled butternut squash mash gives them a subtle sweetness and the bacon adds a salty touch to balance everything out nicely. Now let’s all surf to Joy’s blog, and thank her for the original recipe that sparked this tasty spin off! These waffles are delicious straight out of your hot waffle iron, but they are equally as good the next day, albeit that they lose their crispiness as they cool. Top these babies with a dollop of crème fraiche, and you’ll find yourself in savory waffle heaven. (*) Butternut squash mash is simple to make and a healthy alternative to regular mashed potatoes, See recipe below. 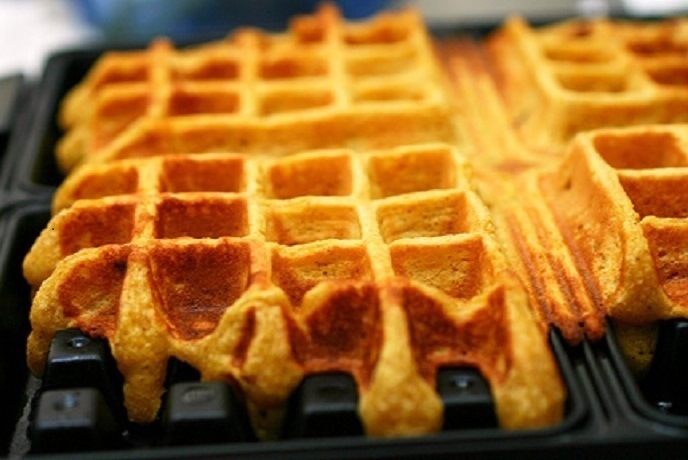 Plug in your waffle iron and allow it to heat so it’ll be nice & hot when you’re ready to bake. Preheat oven to 450F. Line a baking sheet with parchment paper, and place bacon slices on top. Sprinkle bacon lightly with brown sugar and cayenne pepper, and bake at 450F for approx. 10-15 min, until crispy. Set aside on paper towels and allow to cool, then crumble. In a small pan, melt butter over medium-low heat and allow it to brown. When it’s all melted, it’ll start popping and cracklin a bit, which is the water evaporating out of the butter and giving the butter a yummy nutty flavor. Keep watching the pan and wait for the edges to brown slightly. Once you see browned edges, pour browned butter directly into your cooled butternut squash mash, and whisk in the eggs & buttermilk to combine into a smooth mass. Keep on an eye on this process, as butter can go from tasty browned nuttiness to a burned mess in a matter of seconds! Wipe pan with a paper towel, and give diced shallots a quick sauté, until they are translucent. It should only take a minute or 2-3. Set aside. In a medium bowl, sift flour and add baking soda, baking powder, salt & pepper. Fold in the butternut squash mixture and combine into a smooth batter. Add crumbled bacon and reserved shallots, and stir to combine. Place about 1/4 cup of the batter in each section of your waffle iron, and cook waffles according to your taste. I like mine crispy and dark, but that’s just personal preference. Allow waffles to cool on a rack, as placing them on a solid surface will make them soggy and limp. Boil butternut squash together with potatoes until tender. Give it a quick mash, then and add butter & maple syrup. Mash together, and season with salt & pepper & curry powder.